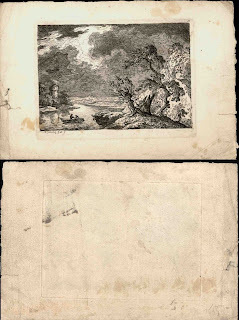 Is the arrangement of subject material that underpins the Foote, Cone and Belding Grid to be seen in early prints? Ever since the development of the Foote, Cone and Belding Grid in the late 1970s, the FCB Grid has been an essential tool for the advertising industry. In essence, the Grid is a design template allocating the most appropriate places in an advertisement to insert imagery and information where a viewer will have the “right” mindset for negotiating meaning. For instance, on the left side of an image a viewer has a propensity to read information with an analytical mindset. Consequently, imagery that leans to a process of rationalisation is well suited if placed in this region. By contrast, on the right side of an image a viewer is more likely to want to respond to imagery intuitively. Thus imagery that is likely to excite the subconscious in a reflexive (i.e. automatic) way—perhaps emotionally—is best placed there. The lower region of an image is where a viewer tends to want to see everyday subject material. Therefore this is the ideal area for subject material addressing temporal issues. Finally, in the upper region of the image a viewer is disposed to see meanings dealing with the spirit. To tap into this way of looking and feeling, imagery evoking feelings of spiritual transcendence or mediates with a viewer beyond everyday concerns is shown here. Of course every artwork engages with a viewer in different ways and so there are no inflexible rules for how an artist should express a personal vision. But this does not mean that the FCB Grid has no value as a guide for visual communication outside of advertising. To explain how the disposition of subject material into pictorial zones has always been a part of an intuitive mind map for artists, even before the FCB Grid was formalised, the following discussion focuses on the example of a remarkably dramatic etching by Daniel Heimlich (1740–96), Lightning in a Landscape. Condition: strong impression on sturdy laid paper. 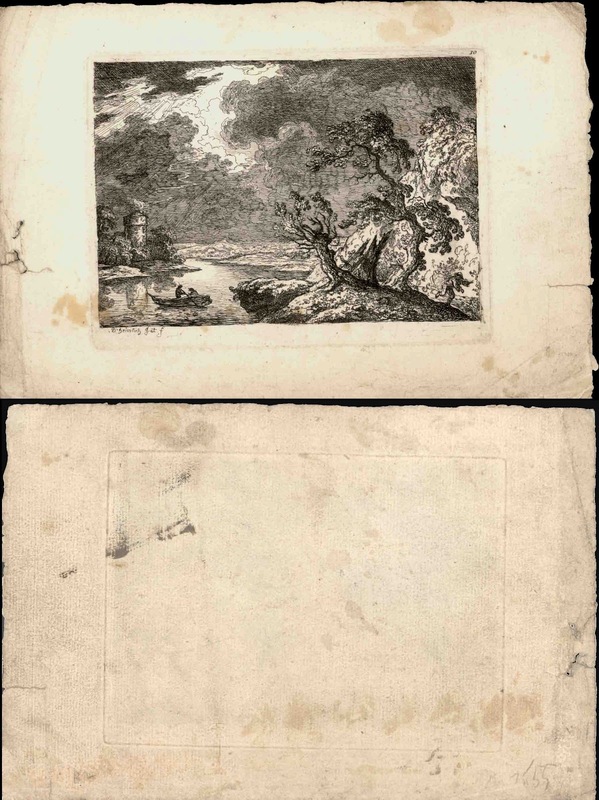 Typical of the period, the lower left margin has holes indicating it was once stab bound with other prints. There are many light handling creases, staining and a 2.5 cm horizontal tear on the right edge that is 2 cm from the plate mark. Verso has numbers (perhaps a collector’s inventory record) written in pencil at the bottom left and ink (?) smudges towards the upper left. I am selling this print for $87 AUD including postage and handling to anywhere in the world. Please contact me using the email link at the top of the page if you are interested or click the “Buy Now” button. 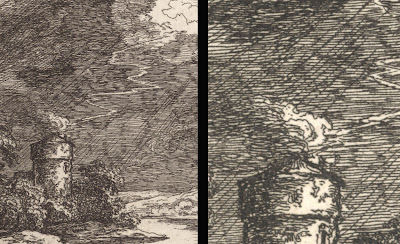 Whether or not Heimlich placed his centre of interest, a lightning strike on a distant tower, on the left side because he knew that viewers are best equipped for looking at and thinking about lightning in this region is unknown. There can be no doubt, however, that Heimlich deliberately composed the image so that a viewer’s attention would be channelled to see the lightning strike on the left (see details below). After all, most of the structural lines point towards the lightning striking the tower; such as, the silhouette edge of the foreground hillock with a running man, the limbs of the two trees on the right, the head of land jutting into the water and the angle of the boatman's oar (see diagram below). From my perspective, the arrangement of lines converging on the puff of smoke does more than invite me to ponder about what may be happening at the top of the tower. There is also a counter invitation for me to look in the reverse direction following the radiating divergence in the lines back to their source. This reflexive to-and-fro bounce in my reading of momentarily looking at the lightning strike and then looking at the surrounding landscape builds upon my understanding of the imagery as a coherent whole. In terms of the FCB Grid, it is this relationship between the pictorial zones (left, right, bottom and top) and the mind's tendency to negotiate meanings from different mindsets in each of these zones is what makes this and other well composed images strong. 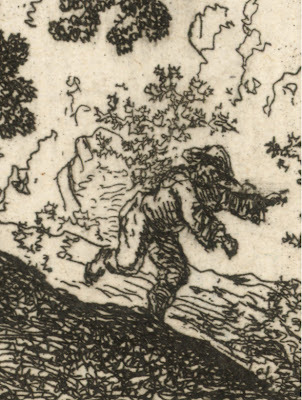 For instance, after seeing the lightning strike my eyes flick back from the tower to the running figure on the hillock edge (see detail below) and I respond with automatic recognition that the figure must be running away from the lightning. This immediate understanding of what is happening matches well with the right pictorial zone of the FCB Grid where a viewer is likely to respond intuitively to imagery. The flick of my eyes back to the trees on the near hillside, also in the right pictorial zone, connects to my sense of drama. I respond to the writhing forms of the trees as analogues of anxiety. 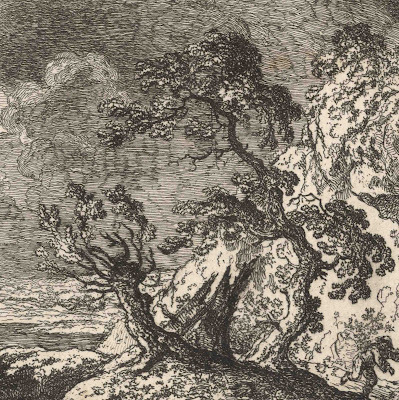 I see them as spooky ghosts of trees rather than trees to be examined as true representations of trees (see detail below). 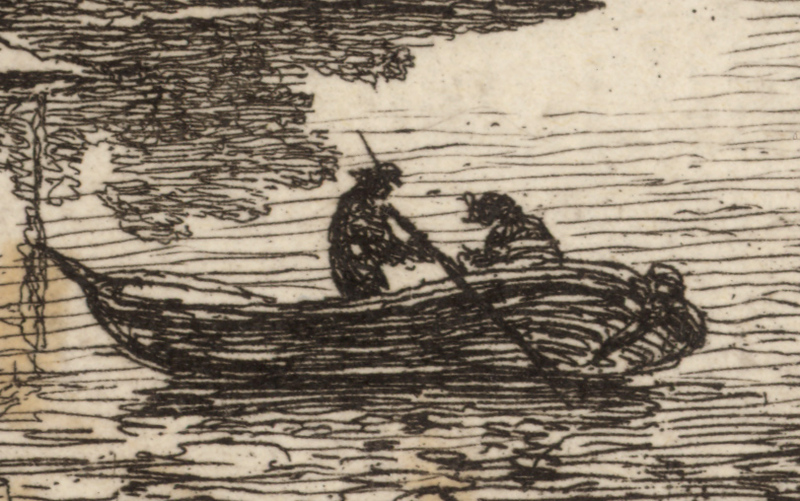 Following the radiating lines my eyes also flick back to the folk on the boat (see detail below). Here, my mind reconstructs what I might be thinking if I were in their predicament. This propensity to empathise with these people is in keeping with the lower pictorial zone of the FCB Grid where viewers lean towards engaging with everyday concerns. 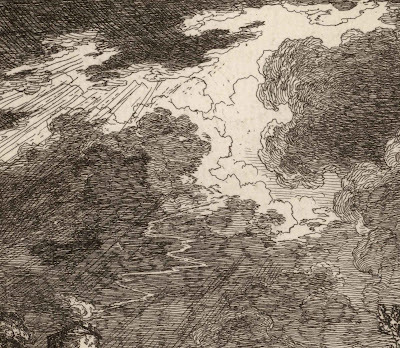 Arguably more critical to understanding the drama of the scene is the notion of the sublime that the lightning itself provides. 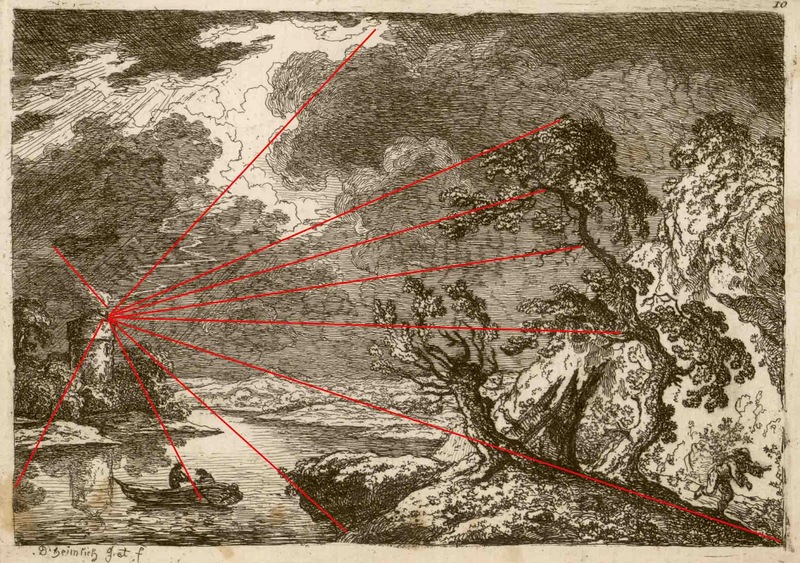 Beyond the downward zigzagging route of the lightning bolt, my eye is also drawn upward to the fissure of light in the cloud bank (see detail below). This upward path has associations with religious imagery where meaning is conferred from a spirit above. There is also a sense of a transcendent spirituality conferred by the partly hidden source of the illumination. Perhaps this intangible feeling of spiritually is an inexplicable understanding of what is concealed in the heavens. In conclusion to the above discussion, the question as to whether or not early artists, such as Heimlich, were aware of the arrangement of visual devices that underpin the FCB Grid, the answer is most likely negative. Nevertheless, the arrangement formalised by Richard Vaughn into the FCB Grid was not a layout constructed by theory but was devised from an inherent way that most viewers (including artists) respond to imagery. Mindful that the FCB Grid draws so directly upon most viewers' ways of negotiating meaning from an image then the arrangement has always existed and is "known" at a subliminal level.